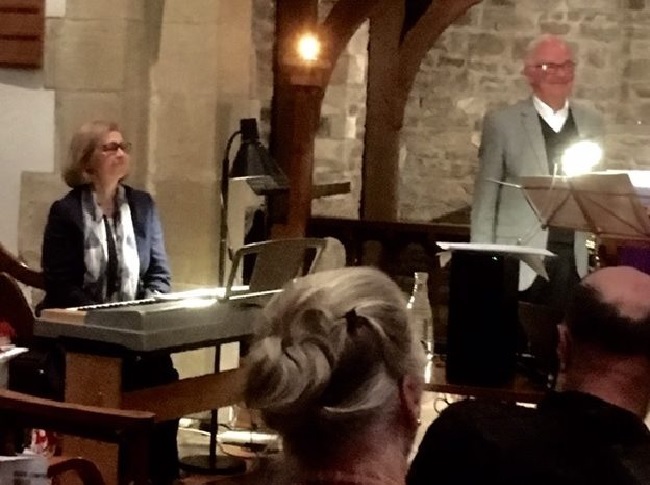 The Friends of St Peter’s Church, Newenden, are immensely grateful to David Campbell, who came to entertain us on Friday, March 29. David has had a fascinating career and is a natural raconteur. He delighted us with anecdotes and with his superb clarinet playing. In the first half of the evening David told us of his early days and explained that winning the Mozart Memorial Prize in the late 1970s catapulted him into an extraordinary, international career. We went into the interval with the sound of the famous clarinet solo from Gershwin’s Rhapsody in Blue ringing in our ears. There was more live performance in the second half, and David’s wife, Veronica, was his accompanist. There were also hilarious stories of disasters in performances, such as one on live television, which the audience loved. The entertainment ended with a glorious performance of Piazzolla’s Oblivion. In addition to giving his services to benefit the charity, David generously donated a box of CDs of his recordings. These were snapped up by the audience as they left the church and donations added to the financial success of the evening, which raised in excess of £1,100 for the upkeep of St Peter’s. 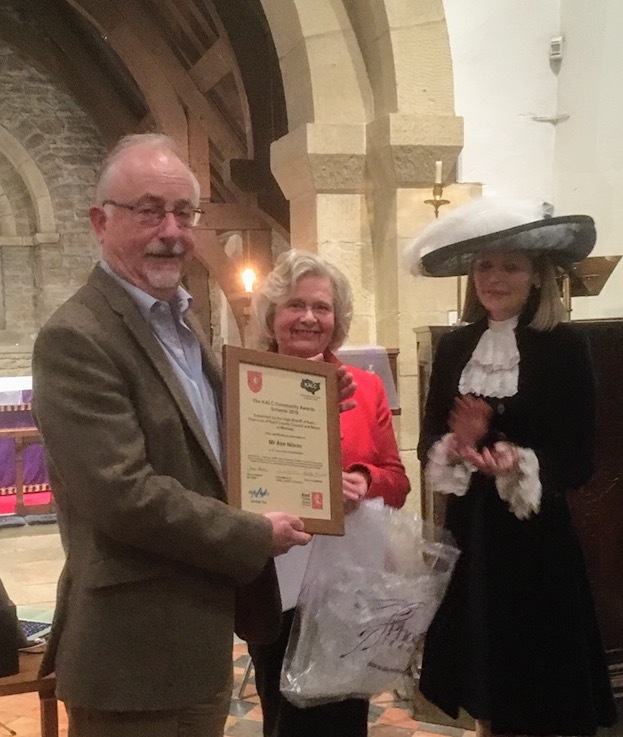 Ake Nilson is presented with an award from the KALC by the High Sheriff of Kent, Jane Ashton with chairman of Newenden Parish Council, Rosie Edmonds. Before David Campbell’s entertainment, Rosie Edmonds, chairman of Newenden Parish Council, introduced Jane Ashton, the High Sheriff of Kent. Mrs Ashton presented Ake Nilson with a Kent Association of Local Councils (KALC) Community Award. Ake Nilson was chairman and member of Newenden Parish Council for eleven years. His unstinting contributions, integrity, empathy and professionalism inspired and enabled cohesion of the village’s community spirit, greatly benefiting the whole village. It was entirely apt that the presentation was made at a Friends of St Peter’s event, as Ake was one of the original team, which set up the charity. The Friends’ fund-raising events have enabled the church to invest in the beautiful new pew cushions, the enhanced flood-lighting system, vital repairs to the roof, the lightning conductor and the clock, the renovation of the churchyard footpaths and the porch floor, and many other items. The next major project is to update the church’s electrics. Thanks to Revd Chris Hodgkins, associate team priest, and Frances Jones, churchwarden, for permission to use St Peter’s, and to Anna Dickerson for donating Worcester Pearmain apple juice. A Magical Marsh Mystery Tour with Ake Nilson, aboard the Rolvenden Rocket Minibus, on Sunday, May 19. The Flower Festival in St Peter’s, June 28 to 30, with talks, music, cream teas and many other activities in the beautifully decorated church. The AGM, followed by an evening cruise on the Dannie Lee on Sunday July 7. The Duck Race on Saturday, August 24. A lecture / demonstration by the curator of our historic organ, Martin Renshaw, on Friday, November 15 at 7:30pm. Martin is an expert on church organs and church history. Not only does he tune and maintain historic organs but he has saved many organs from redundant churches all round the country, restored them and found them new, safe homes, in this country and abroad.